Now that we’re officially in October, thoughts start to turn to entertaining for the season. 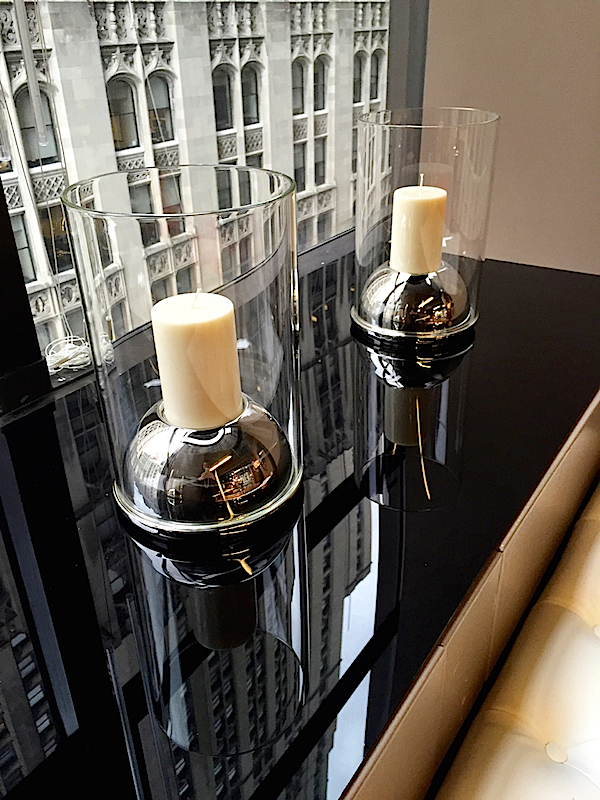 For those looking for some inspiration or perhaps something new to augment their collection, here are a few items, most of which are new tabletop for fall 2015, seen at 41 Madison in the spring. 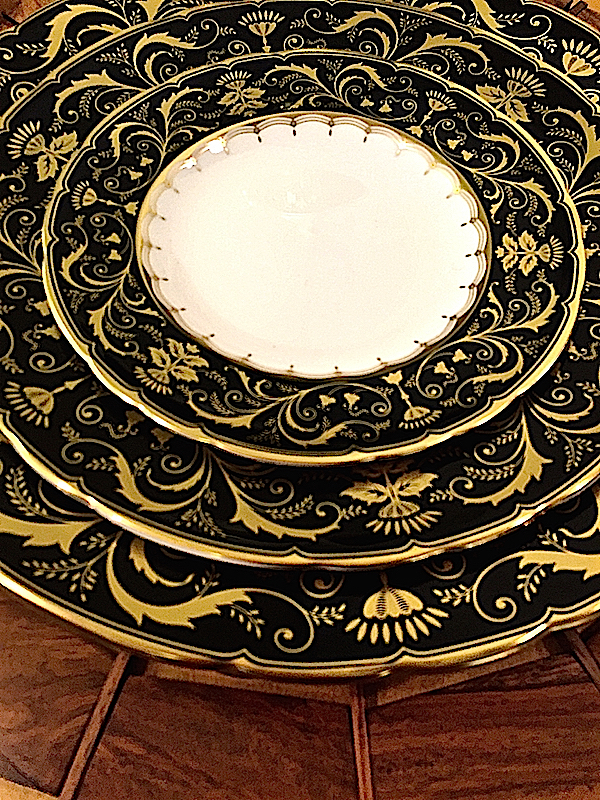 This new version of Royal Crown Derby Darley Abbey in black and gold is a stunning classic colorway that could mix with both traditional or modern table settings. Think how dramatic it could look as a decorative accent with an all black contemporary scheme or anchoring a pretty holiday table of all white. 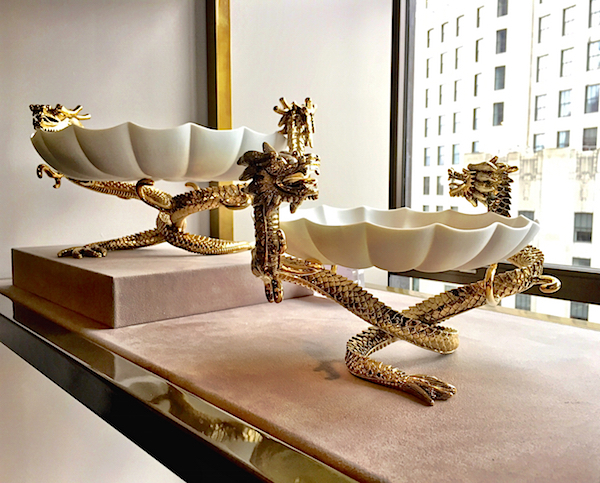 In the same vein, these exotic Dragon Bowls from l’Objet would add a decorative flourish to any tabletop. Whether in a living room with candy (paging Ellie Cullman) or on a dining table with condiments, fruit or nuts, they are a great accent. L’Objet also just launched its first home fragrance collection, Parfums de Voyage. Inspired by Founder & Creative Director Elad Yifrach’s travels around the world, each of the three fragrances tells a unique story. The scent of Mamounia, No. 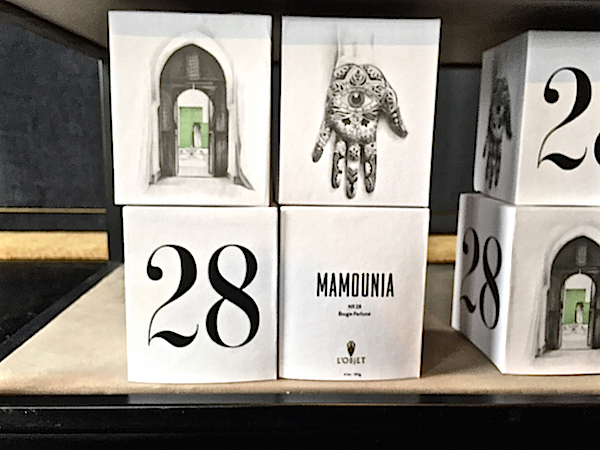 28, below, is based on Elad’s Moroccan childhood with exotic notes of orange blossom, honey, rose petal and leather. The numbers each represent a significant detail in the scent’s backstory, capturing “an unexpected moment of a journey, and recall (ing) the magic of losing oneself in adventure.” Here the 28 references the age of a young woman experiencing the spring rose festival in Morocco. Number 6, Jasmin d’Inde, behind, refers to the time of day in the narrative. The packaging is equally distinctive with the top of the candle doubling as a bronze coaster and illustrations by Gildo Medina, below, eloquently portraying each fragrance’s story. 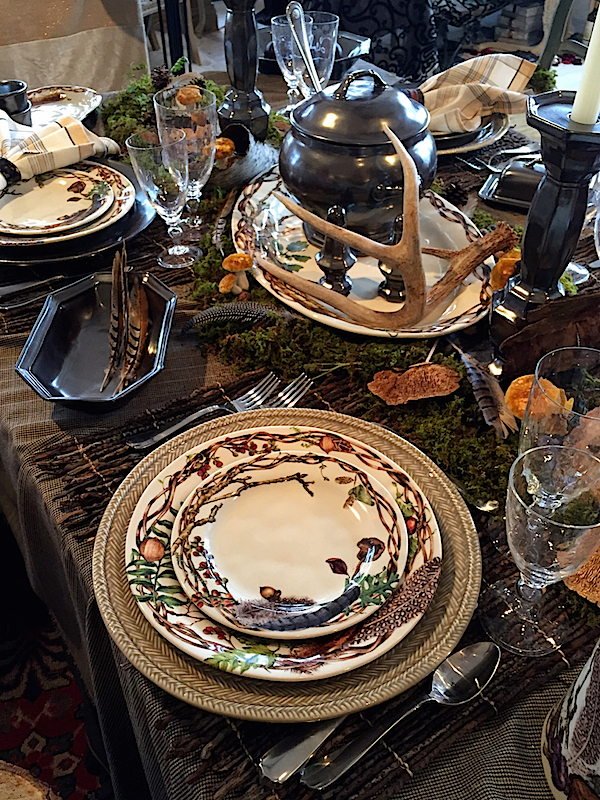 Juliska now has a lovely corner space in 41 Madison and showcased their fall products including the new Forest Walk ceramic stoneware and Pewter Stoneware serving items. Their tables are always beautifully merchandised. You may have seen Paradis, the enchanting collaboration between Fromental and Raynaud. 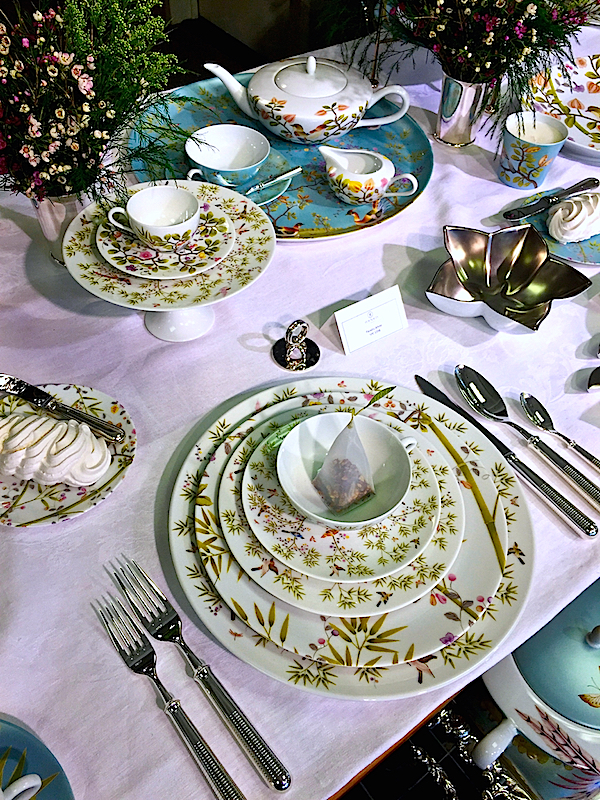 Inspired by Fromental’s exquisite handpainted Chinoiserie wallpapers, the collection exudes the luxurious exoticism of “a welcoming and untouched natural world leading us on a dreamlike journey.” In a wide variety of coordinating patterns and pieces, there are both gift and dining options. 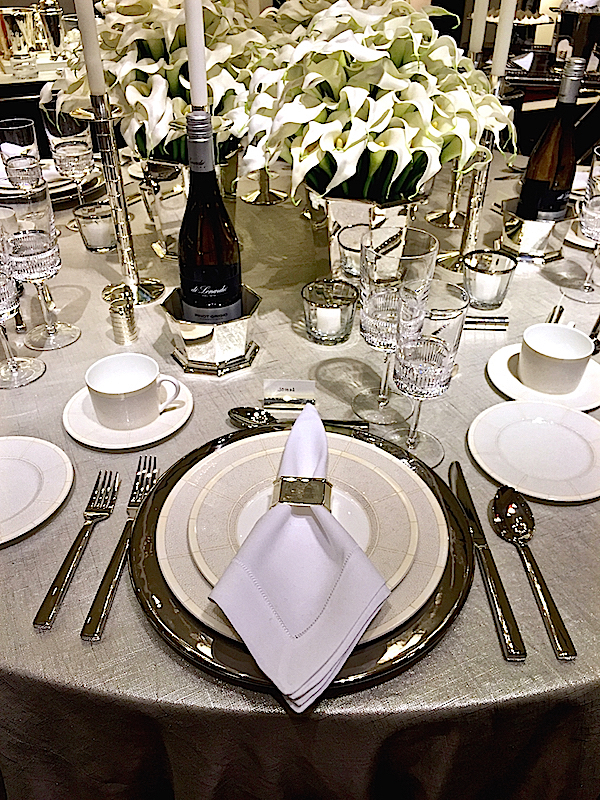 Ralph Lauren presented their elegant shagreen textured Vivienne bone china with their streamlined Academy Flatware and Broughton crystal for an understated neutral table with subtle sparkle and shine. 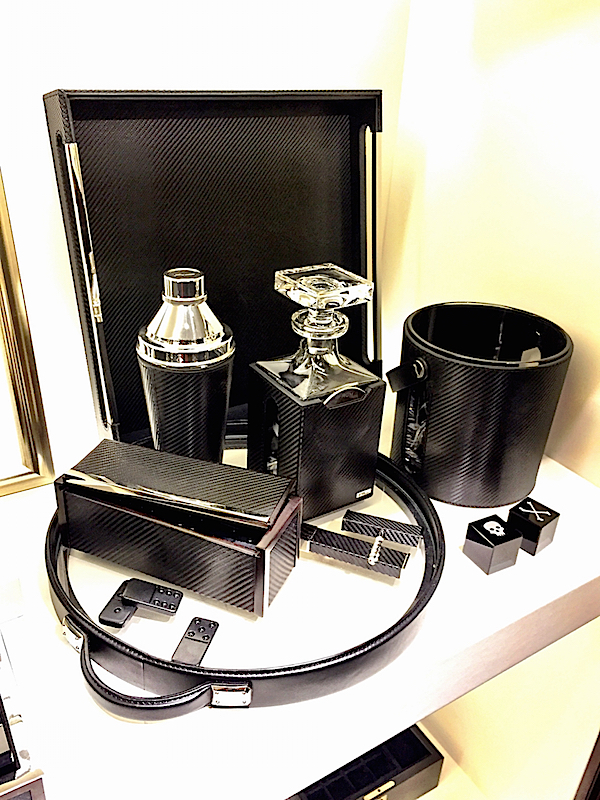 If looking to outfit a man’s domain, the Sutton collection is a handsome one including items for bar and/or office. 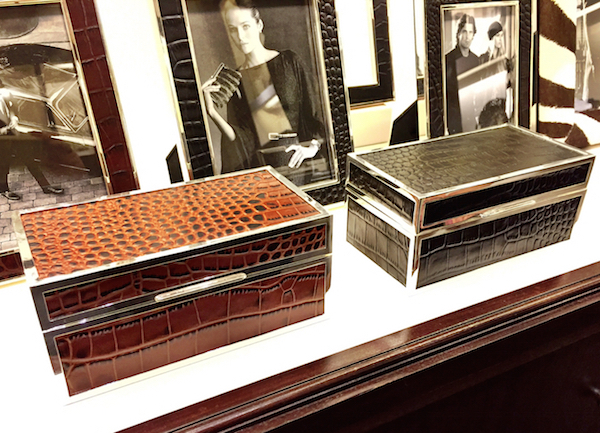 And adding to their popular Chapman frames, are now boxes – a great gift for that ubiquitous man who has everything. William Yeoward is always a choice source for all stylish home needs. 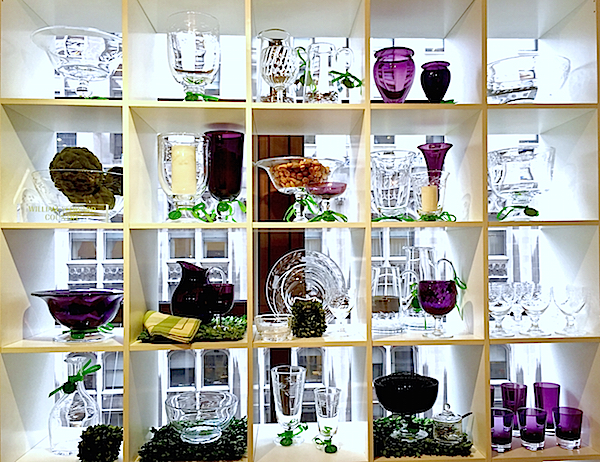 I am currently coveting amethyst glassware, so was immediately drawn to this creative display. His new bone china pattern, Leckford, effectively walks the line between casual and fine dining. The edging that looks like matte metallic gold is actually mica, making it safe for both microwave and dishwasher! 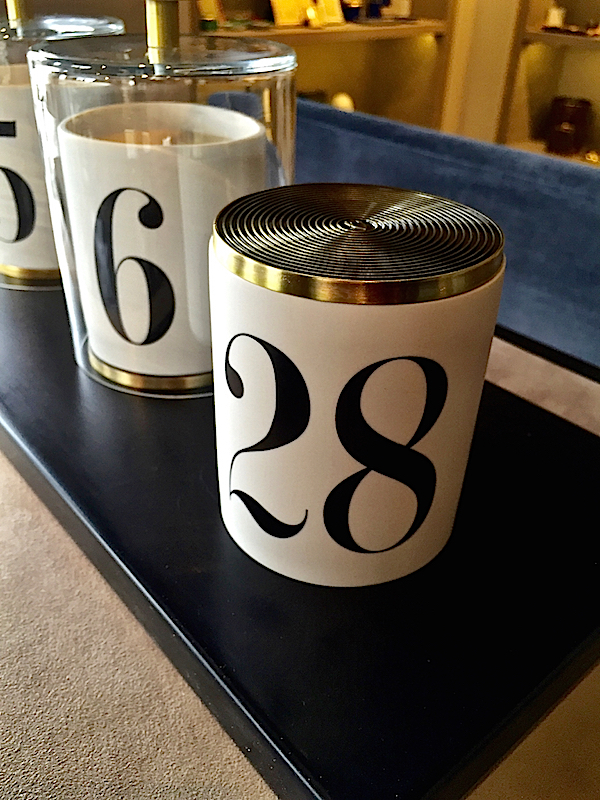 I have written before about the charming Carmen Candle Lamps and the new golden amber shades are the perfect addition for the holiday season. 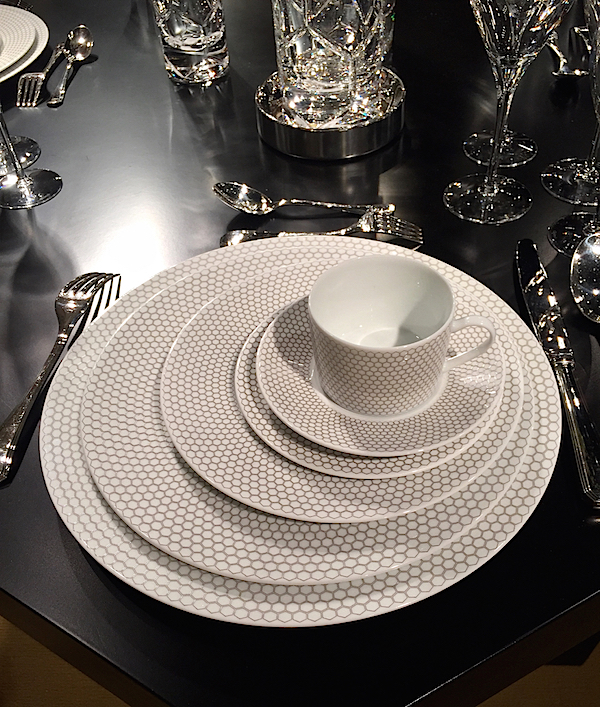 Christofle added a chic new china pattern, Madison 6, the number referring to the hexagonal pattern. Understated and refined with a modern edge, it would mix beautifully with many other patterns or make a minimalist elegant statement on its own. The pattern also translates beautifully to select silver items, such as the tray below with walnut border, shown with the Silver Time tea service, part of the contemporary 19 piece collection designed by Jean-Marie Massaud. 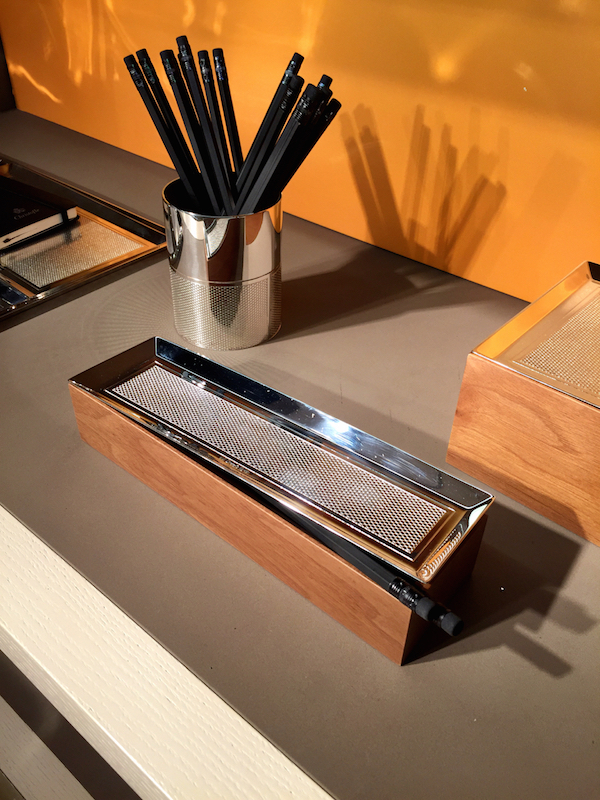 Madison 6 also extends to handsome desk accessories for the well groomed office. The Oh De Christofle stainless cocktail collection now includes a sleek hurricane, perfect for stylish entertaining inside or out. 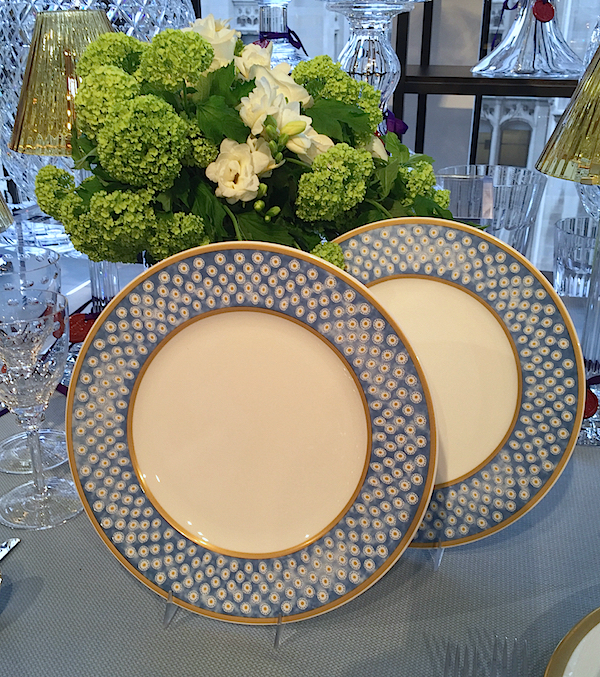 Blue and white is a perennial favorite and two new versions capture the classic combination with exotic appeal. 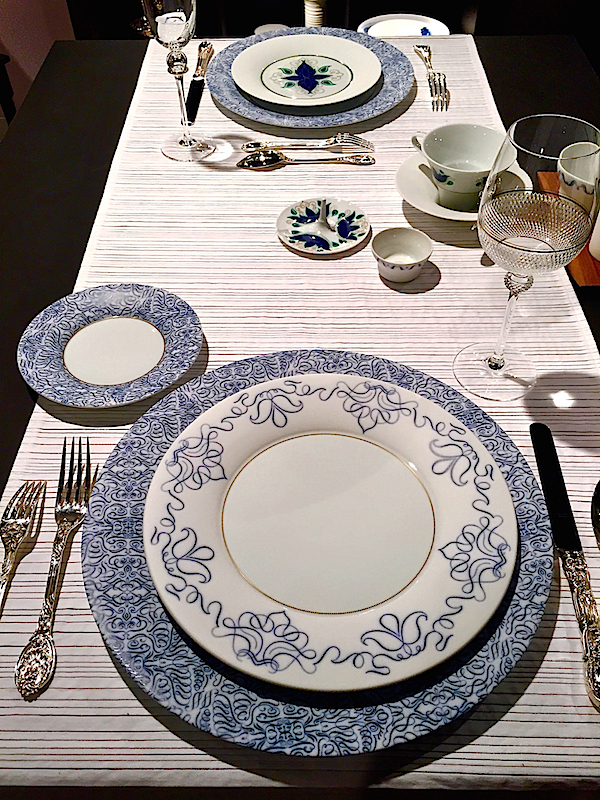 Alberto Pinto’s Shanghai dinnerware references traditional Chinese patterns with a contemporary slant, mixing scale and pattern on the handpainted limoges with the firm’s typical sophistication and style. 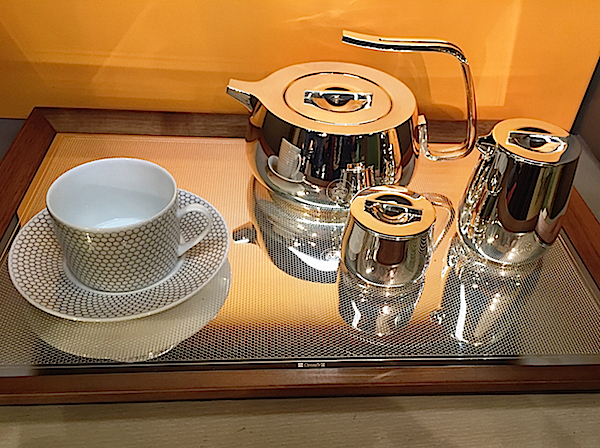 Hering Berlin offers an artisanal modern touch in everything they produce. Innovative, culinary focused and artistically motivated, their designs are “the essence of the table.” The new Alif porcelain is based on “powerful Oriental symbols” with a creative spin on calligraphic forms. This entry posted in entertainment, gifts. Entry Tags: accessories, Crystal, decorative accessories, dinnerware, Porcelain, Tabletop Bookmark the permalink. Excellent design and nice decoration.I really liked all of it. Love the Juliska table, absolutely everything on it. 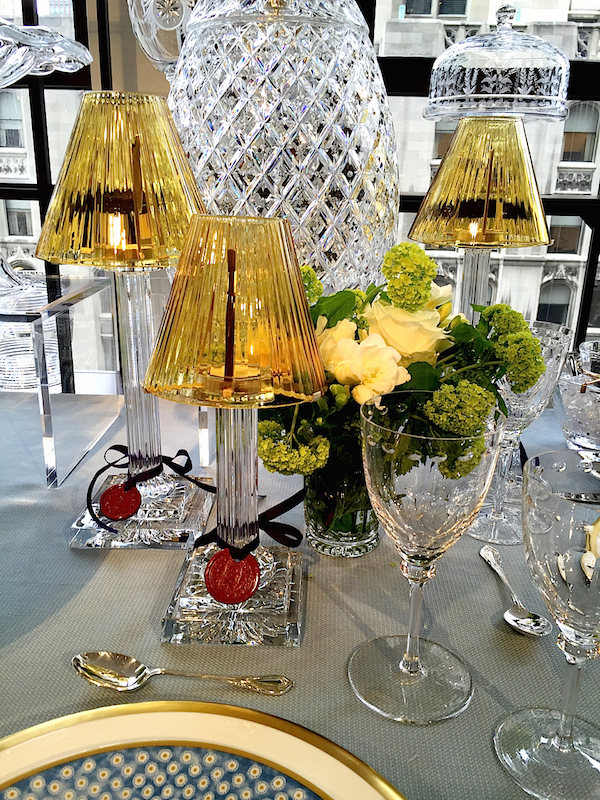 Also, the William Yeoward candle lamps; would love to deploy those in a table setting. Glad to have them on my radar now – thank you! Our Christmas list is getting very long! 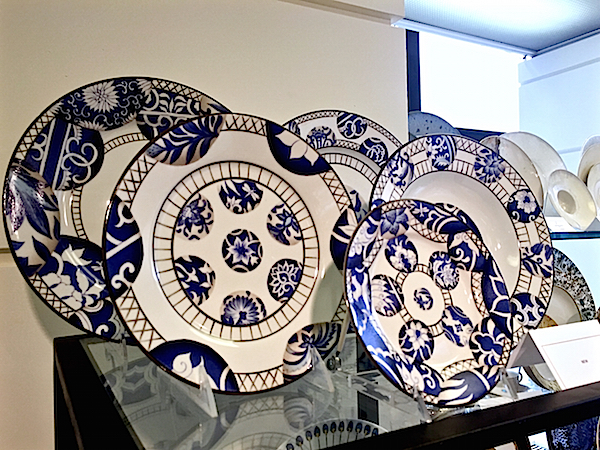 I collect salade plates as the accent for my classic white and gold aynsley pattern. My pocket book is going to get a work out this fall. Simply beautiful designs. 81 queries in 0.433 seconds.